Sub-theme: Organizing Oral History: Institutions, archives, museums, organizations and grassroots groups. 15 Years of International Networking, National Research and Public Promotion For over last 15 years the various aspects of women’s experiences of living under state socialism have been a subject of study by members of an international research project “Women’s Memory”. It was conceived by a group of Czech feminist scholars and activists in 1996. Its major goal was a thorough unbiased analysis of multifaceted life experiences of women from the former ‘socialist bloc’ based on biographical interviewing of three generations of its female survivors. It aimed at deconstruction of ideological myths and popular cliché about “a communist/socialist woman” as a solid homogeneous category. To date the international project includes research teams in seven post-socialist countries (Czech and Slovak Republics, former GDR, Poland, Serbia, Croatia, Montenegro, and Ukraine) which differ considerably in their political histories and experiences of state socialism. United by shared feminist approach and oral history methodology (narrative biographical interview), as well as common ethical principles and documentation rules, those national branches remain relatively autonomous in terms of choosing their disciplinary focuses, cognitive priorities, analytical tools, institutional affiliations, financial sources and ways of presenting the project outcomes to the general public. The proposed panel aims to gather the representatives of national teams of the “Women’s Memories” project to share their unique experiences of studying seemingly similar subjects (women’s experiences of socialism) in the divergent political, cultural and academic contexts those countries represent today. Panelists are expected to discuss methodological and institutional challenges as well as societal impacts of studying women’s memories in the post-socialist countries. The role of feminist oral history in undermining the dominant positivist paradigm, the elimination of androcentric discourse, ridding historical scholarship of ideological interventions will be given a special consideration. The panel will also examine ways to enhance public awareness of different national histories from a specifically gendered perspective, including the role of media (books, TV, internet, radio broadcasting, and film) in such promotional activities. Scholars from Czech Republic, Germany, Croatia and Ukraine will share their experience of implementation of the international research project “Women’s Memories”. Panelists will discuss actual methodological and institutional challenges and societal impacts of studying women’s memories of state socialism in the divergent political, cultural and academic contexts. :: The interviews from the Women`s Memory project were basis for the documentary War in the Memory of Women. This documentary was shooted by the Czech TV in cooperation with Gender Studies. Lifestories of 6 women were broadcasted on 22.5.2005. 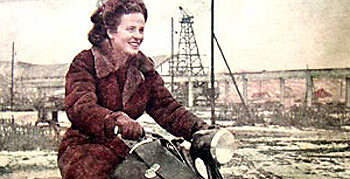 This documentary is considered to be a first summary of women`s war experience in the Czech Republik.